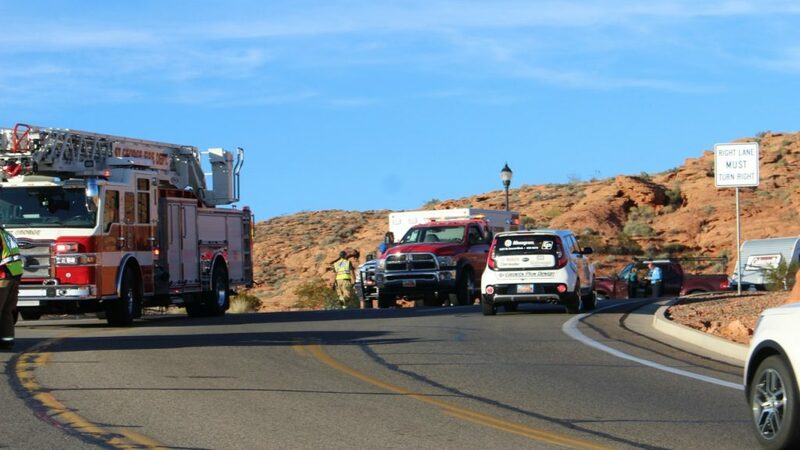 ST. GEORGE — Three people and two small dogs survived a T-bone crash without serious injury Friday after another driver pulled out in front of a pickup truck pulling a trailer on Red Hills Parkway. 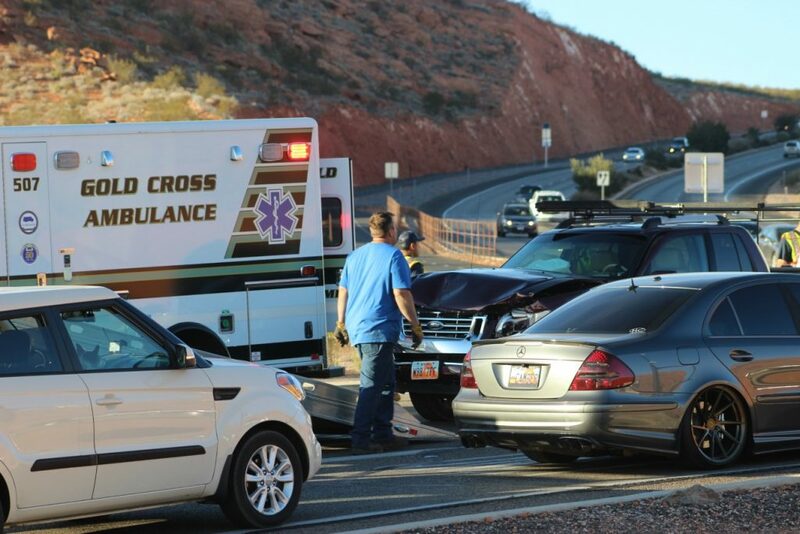 At about 4 p.m., officers and emergency personnel responded to a two-vehicle crash at the intersection of Red Hills Parkway and Skyline Drive involving a black Jeep SUV with a single occupant and a burgundy Ford pickup truck pulling a camping trailer, St. George Police officer Michael Sittre said. Officers were also dispatched to the chaotic scene to direct traffic away from the crash to allow responders to tend to the injured and clear the roadway. The woman driving the Jeep was not seriously injured, while the driver of the Ford sustained a minor injury to his hand during the collision. The couple in the Ford were visiting the area from northern Utah and were headed to LaVerkin to go hiking with their two small dogs when the incident occurred. The dogs “seemed to make it out of the crash okay. They just kind of went with it,” the driver said. At the time of the crash, the Ford was heading east on Red Hills Parkway as the westbound Jeep was stopped behind two other vehicles waiting in the turn lane to make a left turn onto Skyline Drive heading south. 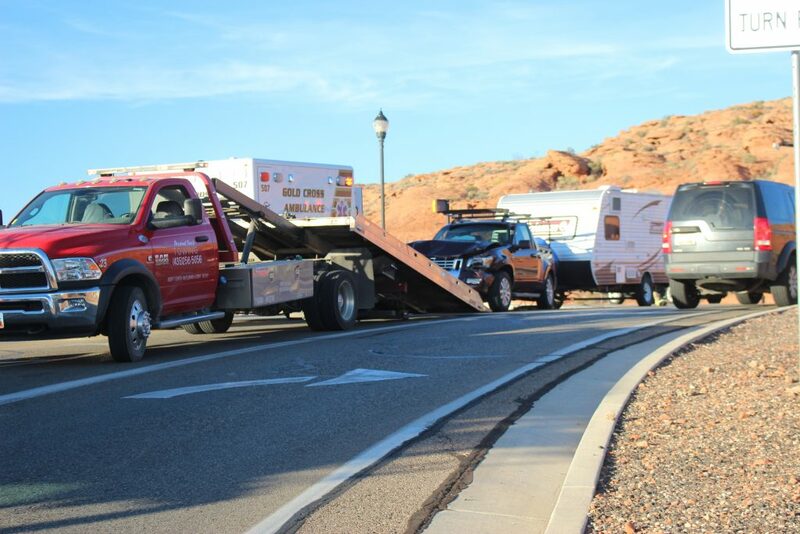 While the first two vehicles were able to clear the intersection without incident, Sittre said, the Jeep pulled out and was struck on the passenger’s side by the eastbound Ford pulling the trailer. The impact spun the Jeep around in the roadway and caused extensive front damage to the Ford. 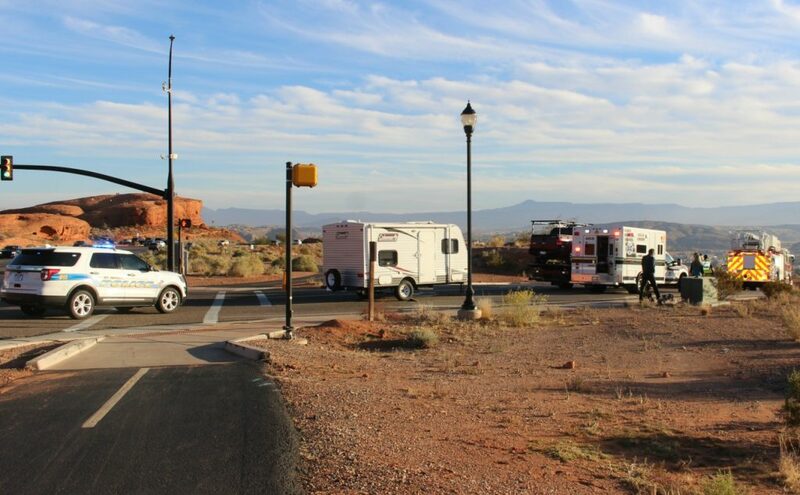 The force of the impact was such that it broke the metal bolts that secured the camping trailer to the steel frame, causing the trailer to slide forward a few inches until it was stopped by the propane tank located toward the front of the trailer frame. 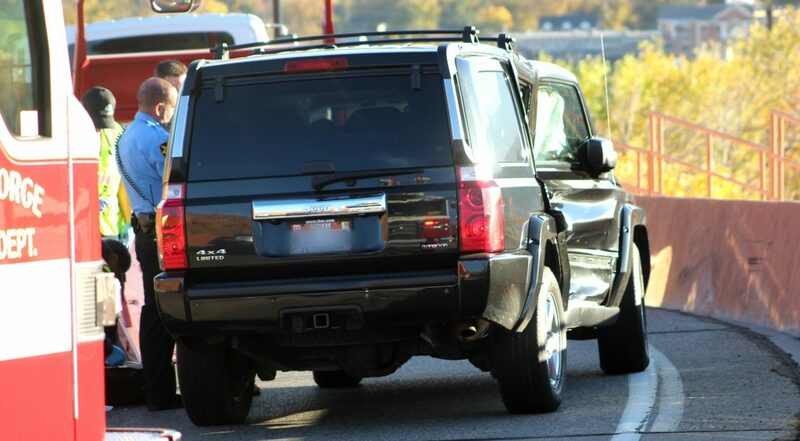 Both vehicles were extensively damaged and were towed from the scene, and the driver of the Jeep was cited for failing to yield before making a left turn. Banzai curve on Redhills Autobahn drive !!!! Now just wondering… last week there was a police radar traffic speed limit monitoring device right there on the East bound lane side just before skyline drive. Wonder if it was still there recently? If not, shows you this long curve is a danger zone. A few years back I was almost hit head in on by a black charger going westbound while waiting to turn left in the turning lane into Pioneer Hills west end parking lot. Charger went over centerline speeding of course and missed my truck by a foot after recorrecting at the last second. Thought I was a dead duck. By the way, not that many black chargers in this town. Actually Utahdiablo is right. Rumor has it, we do not have enough law enforcement to make a dent in regards to proactive traffic enforcement. They are to busy responding to domestic violence, theft, drug-related crime, and accidents, that such an effort would be useless and futile. To pull off a real fix requires a sustained campaign for at least 6 months to a year. Anything less only creates a temporary sesation, and does nothing in the long run. So drive defensively and avoid the crazy drivers of which 40% are distracted on their cellphones, driving illegally at any given time.